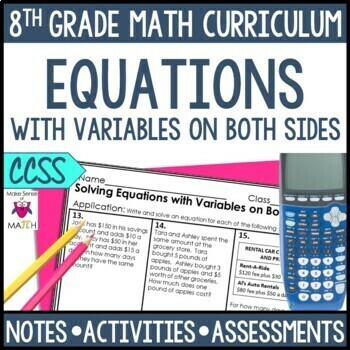 Free up some time with this equations with variables on both sides guided notes and activities bundle. In these guided notes students will delve into understanding equations with one solution, no solutions and infinite solutions. Students will also solve and create their own equations. Students will then practice solving equations with these engaging mystery picture, solve and sort puzzles and task card activities. Check out the previews for the individual products to see what's included! Ideas to implement in your classroom. 16 equations with variables on both sides. ★ FOLLOW ME for more great products to make sense of math! Remember that leaving feedback earns you points toward FREE TPT purchases!